Why should I take a daily multi? As a retailer, you probably get this question a lot. After all, isn’t it possible to get all of the nutrients we need from food? Technically, yes. But the reality is that more than 90 percent of Americans fall short of meeting estimated average requirements for at least one vitamin or mineral. 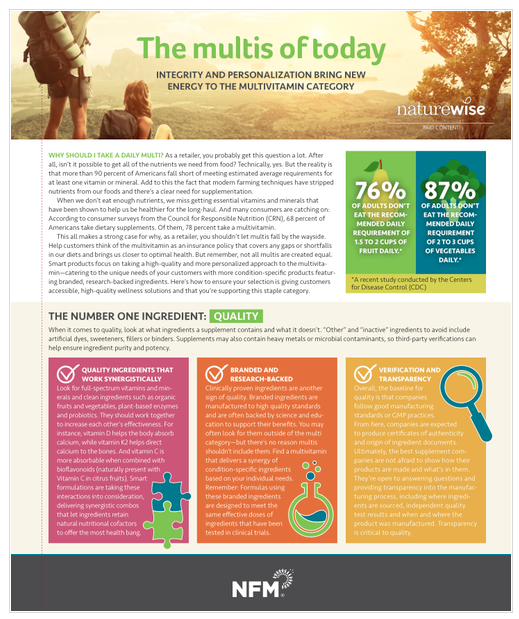 Help customers think of the multivitamin as an insurance policy that covers any gaps or shortfalls in our diets and brings us closer to optimal health. Here’s how to ensure your selection is giving customers accessible, high-quality wellness solutions and that you’re supporting this staple category.